Peak oil doomers compare humans to yeast multiplying inside a sealed petri dish. Our population must bloom, peak and crash, because oil, natural gas, coal and even nuclear fuel must all eventually run out. This view neglects the possibility of tapping high-power energy flows outside the "petri dish". 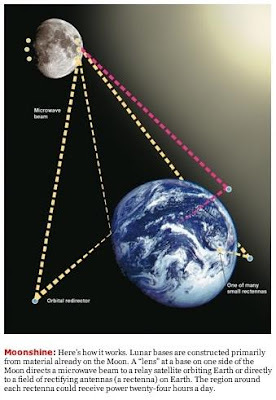 Lunar Solar Power (LSP) is one such system. "Like hydroelectric dams, every power receiver on Earth can be an engine of clean economic growth. Gross World Product can increase a factor of 10. The average annual per capita income of Developing Nations can increase from today's $2,500 to ~$20,000. Economically driven emigrations, such as from Mexico and Central America to the United States, will gradually decrease. Increasingly wealthy Developing Nations will generate new and rapidly growing markets for American goods and services. Lunar power can generate hydrogen to fuel cars at low cost and with no release of greenhouse gases. United States payments to other nations for oil, natural gas, petrochemicals, and commodities such as fertilizer will decrease. LSP industries will establish new, high-value American jobs. LSP will generate major investment opportunities for Americans. The average American income could increase from today's ~$35,000/y-person to more than $150,000/y-person. Another one of those technologies that, in spite of it being in its infancy, deserves closer attention and research money. The payoff of hitting a home run here would be immense! JD, I agree with you on many subjects, but why, oh why, would you want to bounce sunlight of the moon onto Earth when there's plenty of sunlight coming directly from the sun to Earth?!? You clearly need some way of converting the electromagnetic energy of the photons into usable form, most likely electricity. You would have to either 1) install photovoltaics on the moon and then beam the power to Earth through microwaves (or whatever), or 2) reflect the sunlight in which case you still need photovoltaics here on Earth. Aren't you just going across the stream to get water? Please read Criswell's material carefully. Read the file I referenced, and search for Criswell's name on google. He has already answered many of the questions you raise. The main problems with solar energy on the earth are intermittency, land consumption, energy storage and transmission losses. If those problems can be ameliorated, terrestrial solar will be a lot more powerful. Someday, though, we will need extra-terrestrial power in order to continue growth and nurture the earth's environment. Let me explain my why I'm coming down on LSP, which was not at all clear from my previous post. Yes, terrestrial solar power (TSP) will most likely never supply 100% of our energy needs, but it doesn't have to. There are many other (renewable) sources that can complement solar power. I probably shouldn't come down on LSP, because it's not doing any damage :-) My only fear is that it pushes solar power into the realm of science fiction, where it doesn't belong. It will be years, if not decades, before LSP can make a contribution to global energy supply, whereas you can go out and buy a solar panel tomorrow (actually, you can't 'cause the are in back stock due to recent surge in demand). I would much rather focus on the potential of TSP because it's a source of energy here and now, where I see the biggest challenges. But, it's your blog so I promise not to comment LSP anymore. ps. I'm very much intrigued by subjects like LSP myself. I too see Earth as no more than the cradle of humanity. We will conquer space, eventually. Thomas, you're absolutely right about driving air-conditioning with solar. That's a great idea, and I expect it to take off in the coming years. LSP is a mid/long-range idea, and is really the only sustainable option available (right now) for base power. The only other path we have for future base load is breeder nuclear, and that has a lot of negatives, like proliferation, plutonium, and ecological damage due to massive scale mining. The key question for the long-term is this: What we will use to provide base power when all fossil fuel is exhausted? I don't think we need conventional "base load" power at all in the future. As a hobby, I'm currently working on a scheme for satisfying 80-100% of our energy need with renewable energy. All we need, is to organise our energy consumption a little differently. Most renewable energy sources are perceived as intermittent and unreliable when viewed upon from a local perspective. However, if you consider entire regions, such as USA or Europe, there’s always wind and sunshine (except at night ;-)) somewhere. By interconnecting a region with an electrical super-highway, electricity can be moved from places with excess production to places with power shortage at low energy cost via e.g. HVDC lines (google: ‘hvdc shanghai’). Every country/state/county would have installed capacity to meet average consumption, but peak production would be 2-3 times higher (rule of thumb for wind energy). Plug-in-hybrids or electrical vehicles would serve as storage/buffer, charging in times of excess and possible sending power the other way if needed. This mechanism would be controlled e.g. by a price signal superimposed on the AC frequency. Battery technology is much better than most people think, a fact I only just realised about a month ago after reading this article: (google: ‘anb zev’). In the future, if we get most of our energy from renewable sources, our primary energy sources would be electrical, not fossil. This also means that e.g. heating will be done by means of electricity (heat pumps). Heat energy (and cold for air conditioning) can be stored very easily. The effect would be that the ‘inelastic’ power demand (tv, cooking, lights, etc.) would only constitute a fraction of the total power demand. The remaining power demand can be satisfied whenever the price is right. The beauty of this scheme is that it requires no new infrastructure (except the power superhighways) (unlike the hyped-up ‘hydrogen economy’ which will never happen: http://www.efcf.com/reports/ top article (E17)) and can happen very gradually over time. There is no chicken-egg problem because it uses a beefed up version of the existing power grid. There are other elements to my vision of the future, but I’ve already taken up too much space. Yup, a brilliant solution, putting the earth in a microwave oven... I'd love to see the environmental impact study of that technology! Before we start frying the earth in a bath of microwaves, and literally putting all of our energy nest eggs in one huge easy target for terrorists to attack, what about (1) lowering the population growth through planet-wide education of women, (2) a truly just democracy everywhere, and (3) maximizing efficiency and reducing waste at all levels, including the worst two evils of human creation, war and worship at the alter of corporate capitalism? 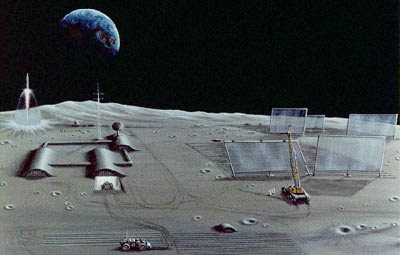 Guys, the lunar bases and solar cells can be manufactured from the surface of the moon, literally. So, the bases are actually self-replicating... period. It isn't science fiction, it is immediately possible. Moon landings were science fiction, but we got off our asses and did it. Infinite electrical energy encourages world peace, and reduces corporate crime. Difficulty to act due to a "lack of resources" becomes easily scrutinized.